PETALUMA, Calif. — Solar panels have sprouted on countless rooftops, carports and fields in Northern California. Now, several start-up companies see potential for solar panels that float on water. Already, 144 solar panels sit atop pontoons moored on a three-acre irrigation pond surrounded by vineyards in Petaluma in Sonoma County. Some 35 miles to the north, in the heart of the Napa Valley, another array of 994 solar panels covers the surface of a pond at the Far Niente Winery. The company that installed the two arrays, SPG Solar of Novato, Calif., as well as Sunengy of Australia and Solaris Synergy of Israel, are among the companies trying to develop a market for solar panels on agricultural and mining ponds, hydroelectric reservoirs and canals. While it is a niche market, it is potentially a large one globally. The solar panel aqua farms have drawn interest from municipal water agencies, farmers and mining companies enticed by the prospect of finding a new use for — and new revenue from — their liquid assets, solar executives said. Sunengy, for example, is courting markets in developing countries that are plagued by electricity shortages but have abundant water resources and intense sunshine, according to Philip Connor, the company’s co-founder and chief technology officer. Sunengy, based in Sydney, said it had signed a deal with Tata Power, India’s largest private utility, to build a small pilot project on a hydroelectric reservoir near Mumbai. Solaris Synergy, meanwhile, said it planned to float a solar array on a reservoir in the south of France in a trial with the French utility EDF. MDU Resources Group, a $4.3 billion mining and energy infrastructure conglomerate based in Bismarck, N.D., has been in talks with SPG Solar about installing floating photovoltaic arrays on settling ponds at one of its California gravel mines, according to Bill Connors, MDU’s vice president of renewable resources. SPG Solar’s main business is installing conventional solar systems for homes and commercial operations. 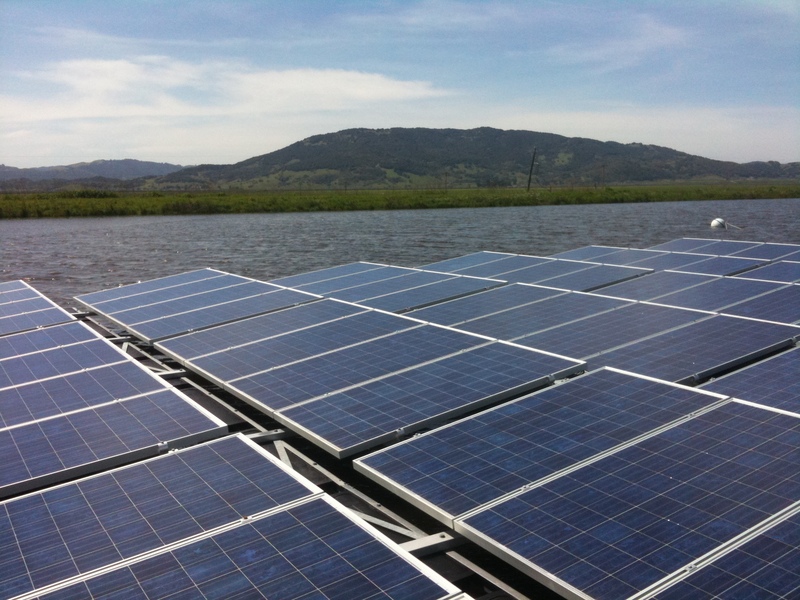 It built Far Niente’s 400-kilowatt floating array on a 1.3-acre pond in 2007 as a special project and has spent the last four years developing a commercial version called Floatovoltaics that executives say is competitive in cost with a conventional ground-mounted system. The Floatovoltaics model now being brought to market by SPG Solar is the array that bobs on the surface of the Petaluma irrigation pond. “We have been able to utilize a seemingly very simple system, minimizing the amount of steel,” said Phil Alwitt, project development manager for SPG Solar, standing on a walkway built into the 38-kilowatt array. “With steel being so expensive, that’s our main cost,” Mr. Alwitt said. Long rows of standard photovoltaic panels made by Suntech, the Chinese solar manufacturer, sit tilted at an eight-degree angle on a metal lattice fitted to pontoons and anchored by tie lines to buoys to withstand wind and waves.